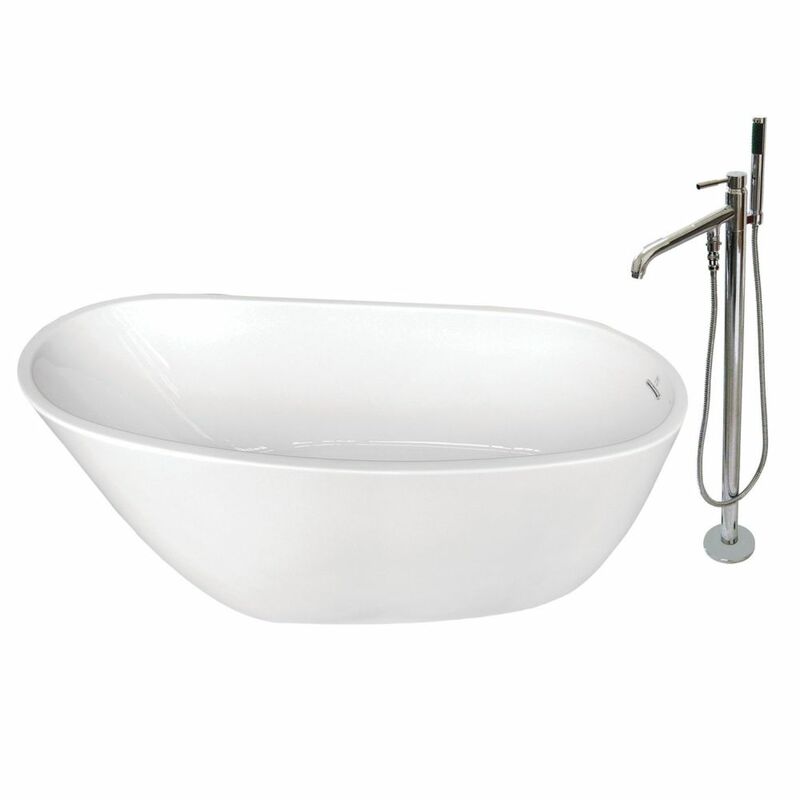 Enhance the elegance and atmosphere of your bathroom with the Vera Solid Surface Freestanding Bathtub. The man-made stone is a combination of ground up natural stone and acrylic resin that creates a durable and velvety feel. Known for its renewable finish, natural heat retention and non-porous traits means that your tub is inherently easy to care for. Perfect for a relaxing and luxurious bathing experience. Luxurious and affordable the MAAX Antigua Aerosens Tub is the best option for your renovation project. The Aerosens air system gently enfolds you from head to toe with therapeutic air bubbles, thus providing an encompassing massage. This simple and affordable system designed for everyday relaxation is easy to operate with its deck mounted on/off push button controlling the 1-speed pump. Designed for drop-in or alcove installation, this tub features a spacious interior for two bathers. Two raised neckrests and a smooth bottom add comfort while the two polished chrome finish solid brass handles add style and safety. The durable high gloss acrylic will keep its shine for years to come. Spacious and elegant the MAAX Cocoon 6636 Aerosens tub features soft curves and is designed for maximum comfort. TheAerosens air system gently enfolds you from head to toe with therapeutic air bubbles, thus providing an encompassing massage. This simple and affordable system designed for everyday relaxation is easy to operate with its deck mounted on/off push button controlling the 1-speed pump. Designed for drop-in or alcove installation this tub features a large bathing well, an ergonomic headrest, as well as built-in armrests which all contribute to the comfortable experience. This tub will be a definite eye catcher in your newly renovated bathroom. SKYE FREESTANDING BATH - CF102 - BATH WHITE ONLY, Dimension: 66 1/2 inch x 29 5/8 inch x 23 3/4 inch, Vacuum formed acrylic reinforced with fibreglass, Scratch, stain and fade resistant high gloss finish, Includes a steel frame with self levelling feet, Includes an integral slotted waste and overflow. REFER TO INSTALLATION INSTRUCTIONS SUPPLIED FOR additional INFORMATION. Fusion 4.9 ft. Acrylic Flat-bottom Bathtub in White and Freestanding Faucet in Chrome With elegant looks, the Fusion Freestanding acrylic tub and faucet combo transforms your bathroom into a personal spa. Relax comfortably with the classic slipper design in a durable acrylic tub constructed. The bathtub includes waste and overflow and holds up to 52 Gal. of water for a spa like experience. The modern freestanding faucet gives the finishing touches of this combo set.